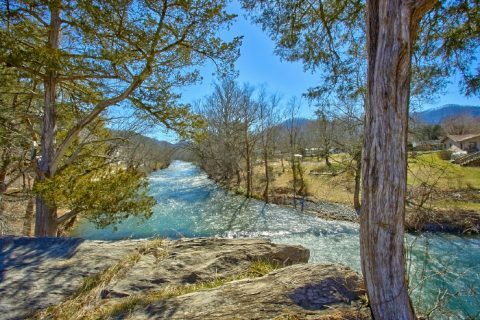 Experience "River Breeze," a luxury three bedroom cabin rental in the Smokies in a gorgeous setting with stunning views, premium amenities, and a comfortable space for enjoying a vacation with friends and family. 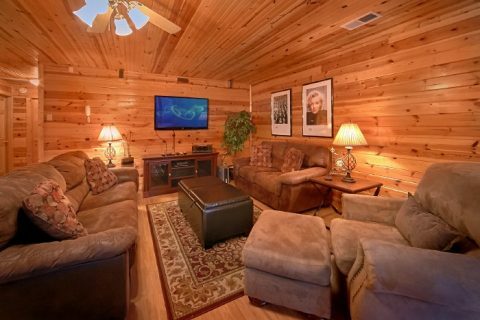 This spacious 3 level cabin sleeps up to 10 guests in comfort and offers everything guests need to relax and play in the Smokies. 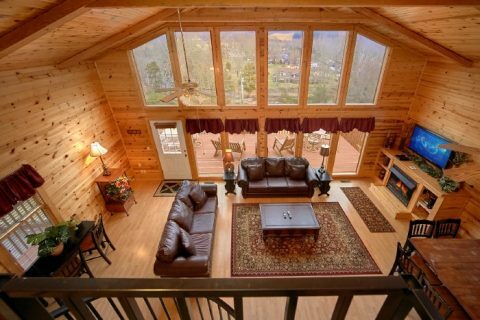 Explore the Smoky Mountains with a top of the line cabin luxury when you stay with Cabins USA Gatlinburg! 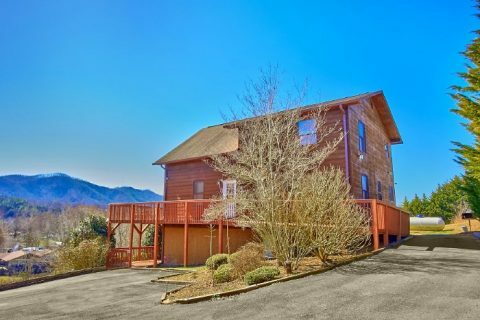 When you aren't resting and relaxing in your cozy rental, you and your family can enjoy great local attractions that are only a short drive away in Pigeon Forge, Gatlinburg, and the Great Smoky Mountains National Park. 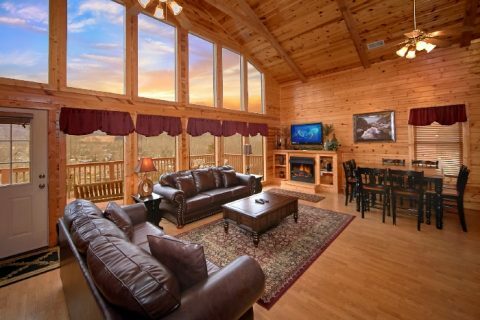 When you return from a day of fun and adventure, you'll have plenty to look forward to in this cozy log cabin with a stunning view of the river and soaring mountains in the distance. 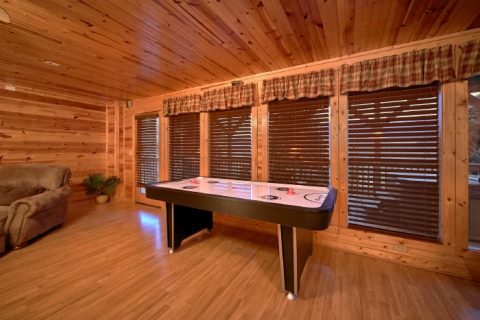 Step into the main level of your cabin rental, and you'll find a spacious game area that's perfect for enjoying in-cabin entertainment. 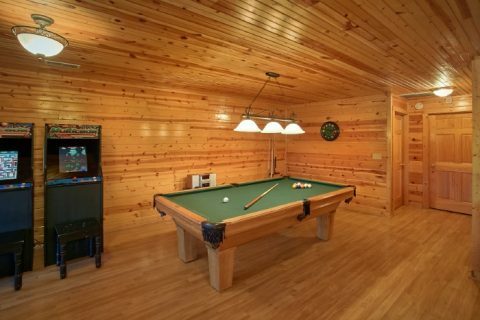 Here, guests can enjoy some friendly competition with a pool table, air hockey table, and stand up arcade games. 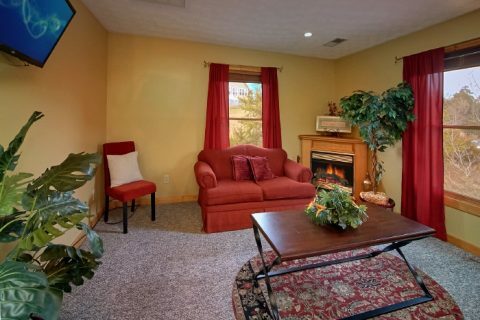 This inviting setting comes complete with a spacious sitting area and a large television for watching the game or your favorite show. 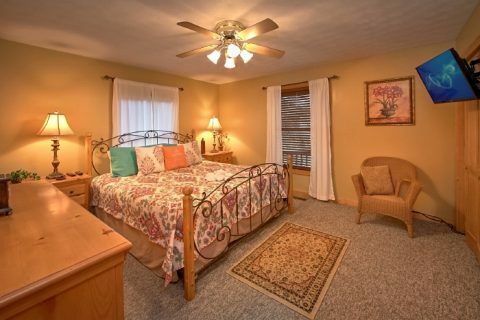 The first of three king-size bedrooms is on this floor. 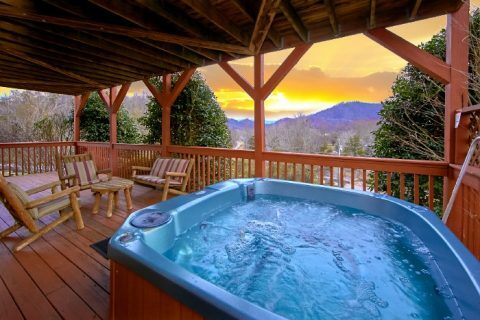 Outside on the lower deck, you can sit back in the soothing waters of your hot tub while you enjoy the sights and sounds of nature from your cabin near the Little Pigeon River. Upstairs on the 2nd level, you'll find a gorgeous open floor plan living area, kitchen, and dining area. This inviting space with a fireplace comes with floor to ceiling windows that allow guests to take in a gorgeous view of the river and nearby mountains. Another private king bedroom is on this floor complete with a private television and windows to let in the natural light. 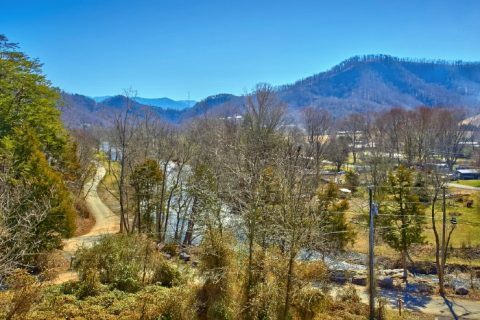 Step out onto the main deck that comes complete with a sitting area for savoring your view of the river and mountains while you enjoy a lunch prepared in your in-cabin kitchen. A wrap-around ramp from the 2nd level deck is helpful for guests with limited mobility to reach this floor without taking the stairs. Ascend to the upper level with the spiral staircase to reach the master suite bedroom. 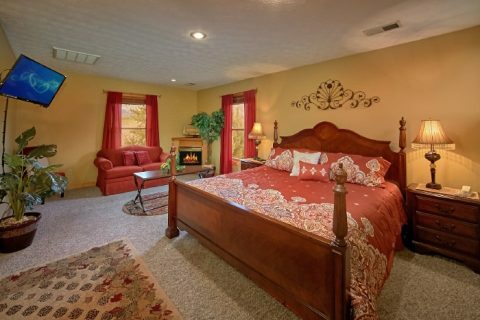 Complete with a king size bed, private jacuzzi bath, fireplace, and sitting area; this room is ideal for romance and relaxation at the end of exciting days in the Smokies. For even more sleeping space, this cabin offers 2 sleeper sofas so that this rental can accommodate up to 10 guests. 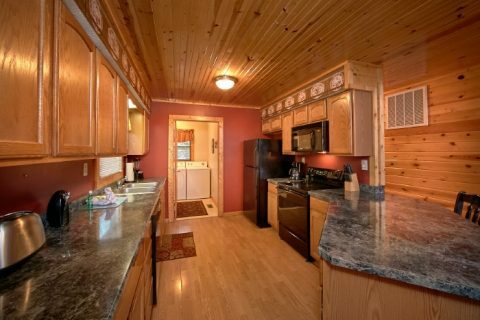 In addition to WiFi access, this cabin also offers guests a charcoal grill for cooking in the great outdoors. 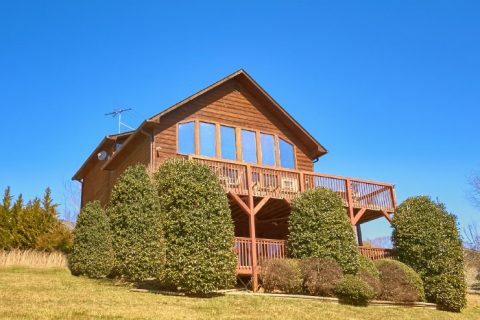 This cabin boasts a large yard that descends all the way to the river, which is within walking distance of this luxury cabin in the Smokies. This lovely rental also comes with flat, paved parking for up to 4 vehicles. 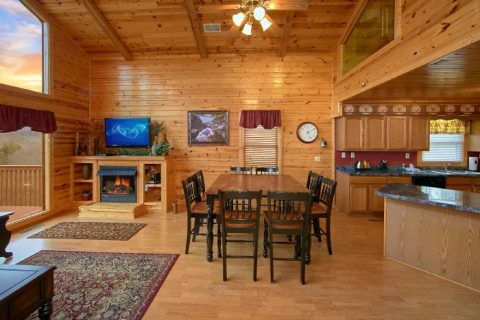 Book this cabin with river views and mountain views can be booked online with Cabins USA Gatlinburg for an additional 15% discount! 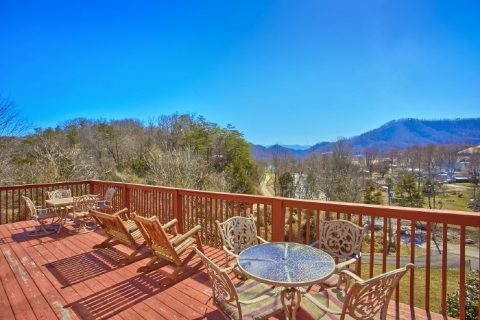 Save on an incredible Smokies vacation experience in the beautiful mountains of Tennessee with your family and friends!